Virginians are facing the growing threats of fraud and identity theft. Consumer fraud and identity theft are growing problems across America. In 2005 alone, Consumer Sentinel, the complaint database set up by the Federal Trade Commission, received over 685,000 consumer fraud and identity theft complaints. Consumers reported losses of more than $680 million. Nationally, the lowest rate of fraud complaints in 2006 was in South Dakota at 79 per 100,000 population. Tennessee's rate of consumer fraud complaints stood at 113.8; Maryland was 154.1 and North Carolina was 116.3 per 100,000 population. 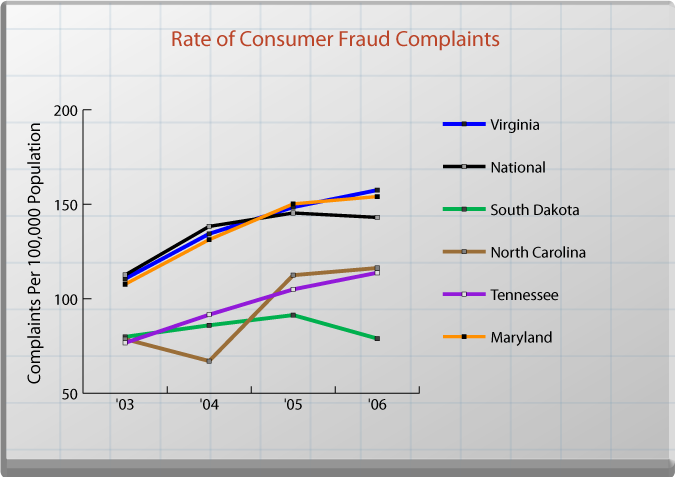 Winchester, VA-WV Metropolitan Statistical Area was the only Metropolitan area in Virginia that fell within the top 50 consumer fraud complaint areas nationwide, ranking 14th. Tennessee's rate of identity theft was 61.3, Maryland's was 82.9 and North Carolina's was 64.9 per 100,000 population. The national average was 82.2 per 100,000 population. 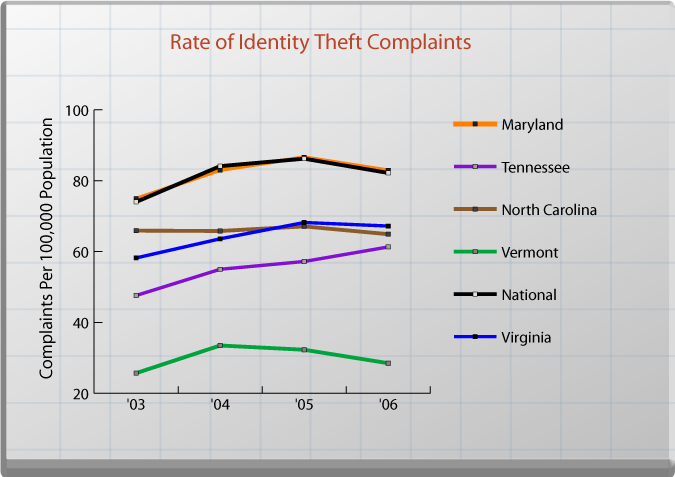 No major metropolitan area in Virginia fell within the top 50 areas for identity theft complaints. Education and information, legislation, and effective law enforcement all work together to reduce consumer fraud and identity theft. The state's role is to educate residents on how to protect themselves; to enact appropriate legislation; and to investigate and prosecute offenders. Within Virginia, the Office of Consumer Affairs at the Virginia Department of Agriculture and Consumer Services provides protection to consumers against fraudulent, deceptive and illegal practices in the marketplace. In addition, various other agencies provide consumer information, including the Department for the Aging, the Department of Professional and Occupational Regulation and the State Corporation Commission. In terms of law enforcement, the Investigations Unit at the Office of Consumer Affairs handles consumer complaints that may contain violations of the Virginia Consumer Protection Act. The Investigations Unit works closely with the Office of Attorney General and local Commonwealth's Attorneys to stop illegal activities, and to pursue civil and criminal prosecutions. Federal Trade Commission, Consumer Sentinel, "Consumer Fraud and identity Complaint Data" (2004, 2005, 2006). Population data based on U.S. Census estimates, 2005. VDACS Office of Consumer Affairs: Provides protection to consumers against fraudulent, deceptive, and illegal practices in the marketplace. Handles complaints in which the product or service is intended for personal, home or family use. State Corporation Commission: Handles complaints regarding insurance companies, financial institutions, securities and retail franchising, utilities, and telephone companies. Department of Professional and Occupational Regulation: Handles complaints against individuals and entities that are subject to oversight by the boards within the department. Motor Vehicle Dealer Board: Handles complaints involving automobile dealers.